so He can reconstruct your heart"
Well, let's just say that it's not been the summer I thought I was going to have!!! 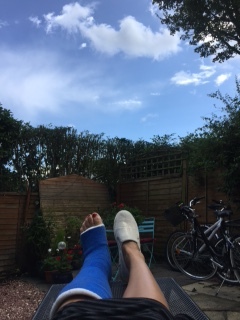 If I was going to have an accident ...to slip over on the back door mat....in my wedges...feeding the dogs.. and dislocate and fracture my ankle...then I'm so glad I was at home with family around and with access to swift expert medical help. The accident was so sudden and it was immediately obvious that I couldn't sort it on my own! I'm pretty squeamish so I'll save you the details, but the angle of my foot prompted me to say out loud "I've just done something really bad". Funny isn't it, when you know you need help - when you know you can't sort it yourself? Prayers have definitely been answered for my physical healing, and also for generally "coping" with this "detour": the resting, and slowing down - I couldn't do this on my own! God is good. So I'm resting and healing and running into His arms (metaphorically of course!) for the internal work He's doing in my heart as well as in my ankle.